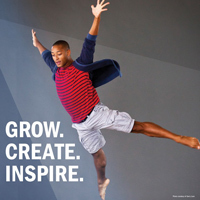 Webster University’s Department of Dance will host its annual Summer Dance Intensive July 25-29 and its second annual Junior Summer Dance Intensive July 20-22, welcoming middle school, high school, and college students to participate in a variety of daily dance classes taught by Department of Dance faculty and guest artists. The schedules are set to include Ballet, Modern, Jazz, and Musical Theatre Dance along with a combination of Tap, Hip Hop, Aerial, Pointe, Injury Prevention, and Improvisation. These classes will not only be taught by Webster Dance faculty, but also by professionals with international credits. Faculty for the 2016 Summer Dance Intensive includes Jan Cosby, Maggi Dueker, Ellen Isom, Lynette Khoo-Summers, Alicia Graf Mack, Leslie Murphy, Donna Patzius-Hill, Beckah Reed, James Robey, Ashley Tate and Michael Uthoff. Faculty for the 2016 Junior Summer Dance Intensive will include Maggi Dueker, Rachel Loeb, Alicia Graf Mack, Jennifer Huffman Olivas, Leslie Murphy, Donna Patzius-Hill, Beckah Reed and James Robey. Visit the Summer Intensive site to read faculty bios. The intensives will be held in the Jean and Wells Hobler Center for Dance on the home campus. Spots are still available for both the five-day Summer Dance Intensive and three-day Junior Summer Dance Intensive. For more information on the Summer Dance Intensives or Webster Dance, call 314-246-7747, email dance@webster.edu, or visit the Department website at www.webster.edu/dance.